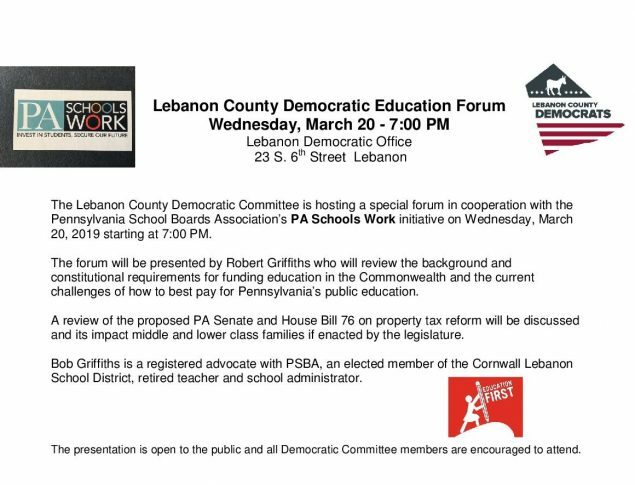 The Lebanon County Democratic Committee is hosting a special forum in cooperation with the Pennsylvania School Boards Association’s PA Schools Work initiative on Wednesday, March 20, 2019 starting at 7:00 PM. The forum will be presented by Robert Griffiths who will review the background and constitutional requirements for funding education in the Commonwealth and the current challenges of how to best pay for Pennsylvania’s public education. A review of the proposed PA Senate and House Bill 76 on property tax reform will be discussed and its impact middle and lower class families if enacted by the legislature. Bob Griffiths is a registered advocate with PSBA, an elected member of the Cornwall Lebanon School District, retired teacher and school administrator. The presentation is open to the public and all Democratic Committee members are encouraged to attend.